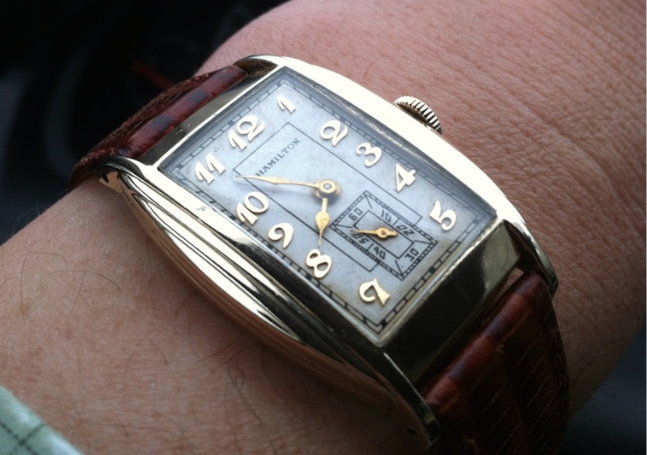 I recently overhauled a 1935 Hamilton Drake and it reminded me I haven't posted any info about this model yet. Introduced in 1935, the Drake was produced for only two years. It came in both yellow and white gold filled cases. Three different dial choices were available too - an AGN dial, an enamel dial and a luminous dial. The latter two dials were less expensive but also appear to be the least common as well. 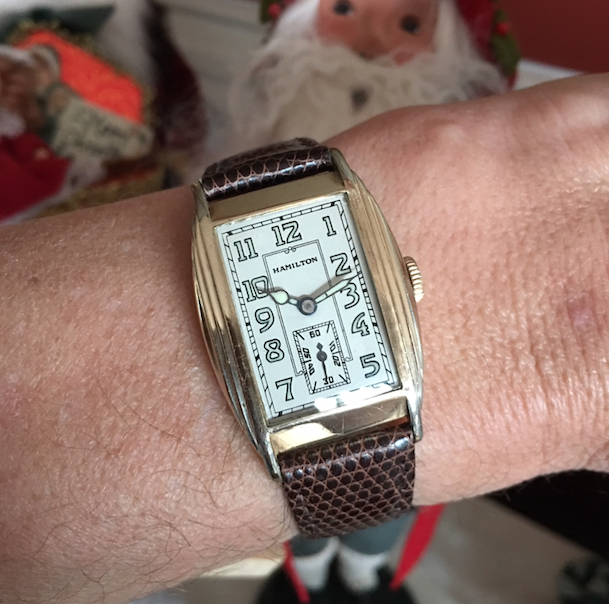 I guess if you had enough money during the Great Depression for a fine watch, you didn't worry about the extra $2.50 needed for the "top of the line" dial. Drakes are commonly found with wear through to the bezel high points starting at the lugs and working up to the corners of the crystal. 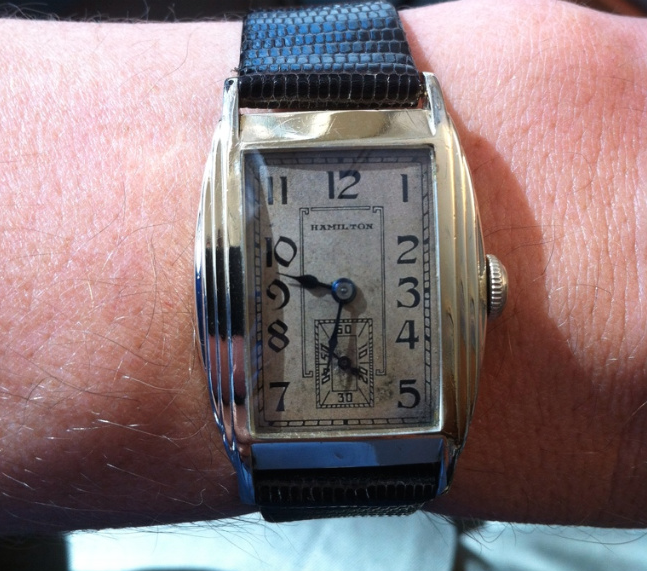 The stepped case is very distinctive and the Drake may be the largest watch produced in the 1930s. If not the largest, it's certainly in the top three. 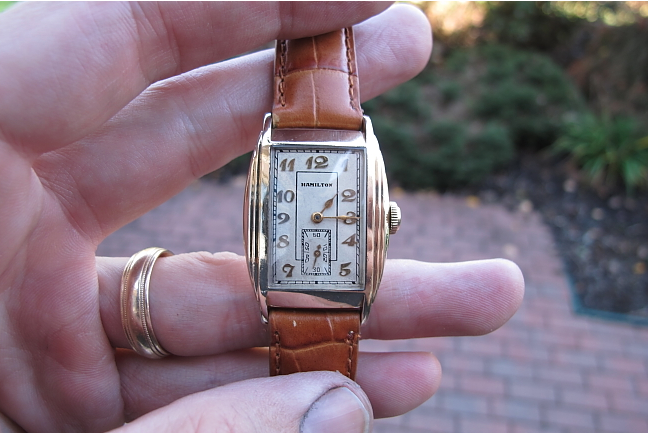 Here's the Drake I just finished overhauling... it's a very nice example with a nicely refinished dial. Here's a wrist shot of another AGN Drake. I need to take a better picture of my enameled-dialed Drake. This original dial is very dark and coupled with the font, it reminds me of a most-wanted poster from the wild west. Here's nice example of an enamel Drake in a white gold filled case. Based on the hairy arm you know this isn't my watch... or at least not my arm. This watch belongs to Tom Diss. And here's a luminous dialed Drake in a yellow case. If you could get all three dials in both cases you'd have a nice little Hamilton collection, that's for sure! Hello and nice work! I have one of these Drake watches and want to replace the crystal. do you happen to remember the G-S part number? Thanks! hi, Dan. 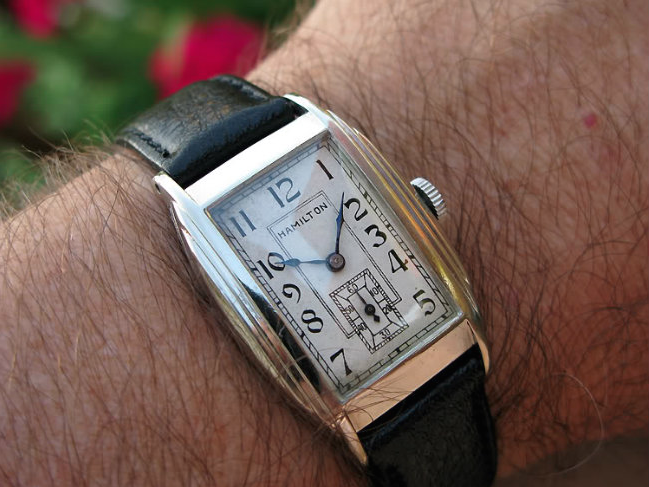 is there is a version of the Drake without the inside rectangular border on the dial? i've seen a Mason piece without and i was wondering if there were other variants. thanks! To my knowledge all of the dial patterns have the inside border. There are often refinished dials that are close but not entirely accurate.